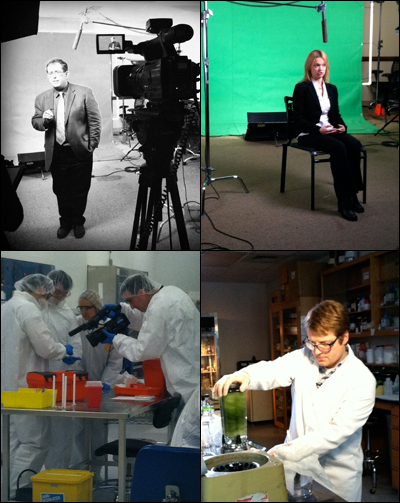 Clockwise from top left: Professor Reza Ghodssi, Postdoctoral Researcher Ekaterina A. Pomerantseva, Research Assistant Adam Brown, filming in the clean room environment of the Fab Lab. A film crew spent two days on campus in December shooting footage of the researchers, students and laboratories involved in a project that harnesses the inherent properties of the Tobacco mosaic virus to build prototypes of high-power, long-lasting batteries of the future. The mini movie, which will become available in 2012, will be part of a National Science Foundation series of short, exciting videos designed to stimulate high school students’ interest in science, technology and math careers.